An Eye for an Eye is generally what people think of when discussing early-80’s Chuck: it’s a little slow, a little dull, but it’s steady, solid, and gets the job done. Perhaps the filmmakers didn’t trust Chuck alone at this early period in his career, so they loaded the movie up with action fan favorites: Mako, Professor Toru Tanaka, Roundtree, and of course Christopher Lee. Unfortunately, the fight between Mako and Tanaka left a bit to be desired, and Lee doesn’t show up until 43 minutes in. He should have been more murderous and sinister. But he does his usual professional job, and his mustache and pipe make him seem so sophisticated. Amazingly, in the same year, 1981, Lee starred opposite none other than Eddie Deezen in another San Francisco-set movie, Desperate Moves (1981). We don’t know which was filmed first, but to go from Eddie Deezen to Chuck Norris, or vice versa, is enough to make your head spin. This was the phase of Chuck’s career where he had a blonde mop-top and no facial hair. He might be the only man of action to make the sweater-with-a-collared-shirt look seem intimidating. 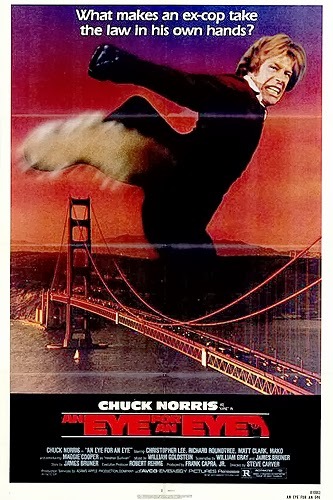 An Eye for an Eye follows the formula of “Chuck chasing a hulking brute who’s going around murdering people” template later used for Silent Rage (1982) and Hero and the Terror (1988). While Mako makes a great sidekick, and there are some excellent moves displayed in the fight scenes, there’s no conceivable reason why this needed to be 104 minutes. It should have been 90 at most. But then again, this was before ADD had come along and ruined people’s attention spans. That’s just the thing: as we talked about in our Hero and the Terror review, we’re not against slow paces necessarily, but take a comparable action star of the day like Arnie. His personality, accent and charisma can help viewers power through the boring parts. Chuck doesn’t have those tools at his disposal. His co-stars ended up falling into some similar ruts: Roundtree ended up playing BYC’s again, most notably in A Time to Die (1991). Director Carver apparently had no problem with Chuck’s shortcomings and went on to work with him again with Lone Wolf McQuade (1983). From there he did Bulletproof (1988) with Gary Busey and Danny Trejo, and River of Death (1989) with Dudikoff. So his resume of video-store action speaks for itself. Finally, it should be noted that fan favorite Richard Norton is listed as a stuntman, but doesn’t appear in the movie, unfortunately. An Eye for an Eye certainly has its moments, but there’s some dullness surrounding them, which is a common problem for Chuck movies. Don’t hesitate to see it, just be prepared for that. A very accurate review, as usual. Action movies were slower in the early 80s. It wasn't until ca 1984-85 when things started to be more OTT, e.g. 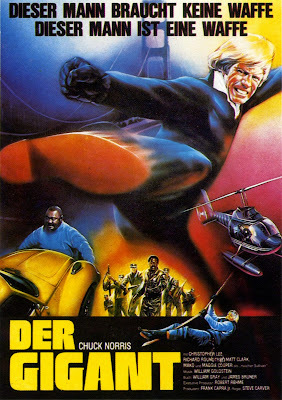 Commando, Invasion USA and Death Wish 3. I saw this movie in the now-defunct theater Bio City in Helsinki. Just 3 people were in attendance. For being what they are, early action movies, I still enjoy Chuck's early 80s output. Totally agree, love the more over the top-ness of Commando and Invasion USA. Death Wish 3 is insane. Haha. That's really cool you saw this in the theater.